Just as the end of the American Revolution brought the Black Loyalists to Nova Scotia, so the end of the next major war brought a different group of Black settlers to the province. The second group came from Jamaica. They were known as the Trelawney Maroons after the town from which they came. The Maroons were a determined group of freedom fighters on Jamaica. For nearly a century and a half, beginning in the 1650s, they had waged an intermittent war with the British administration of the island. They wanted independence. In 1795 the administration in Jamaica decided to remove the Maroons. Three ships brought 543 men, women and children to Halifax in late June 1796. The Commander-in-Chief for the British at Halifax was Edward Augustus, Duke of Kent (later on, the father of Queen Victoria). Edward was impressed by the proud bearing and military skills of the Maroons. He was pleased to see them join Nova Scotia militia units and he had them work on building projects such as the third Halifax Citadel and Government House (residence of the lieutenant-governor). Lt. Gov. Sir John Wentworth was also impressed by the Maroons. He thought they would be good colonist and selected the Preston area for them to settle. Thanks to a large subsidy from the government of Jamaica, arrangements were made for limited schooling and religious services. 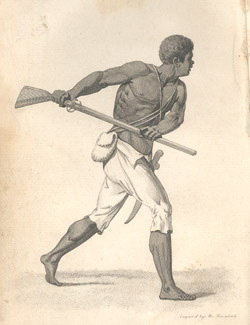 The Maroons, however, rejected the idea of low-paid physical labour. Only a few became farmers: a small number who became Christians and who settled in Boydville in the Sackville area, where there is still a Maroon Hill. Most of the rest of the Maroons, like nearly half of the Black Loyalists a few years earlier, began to wonder if Nova Scotia was a good choice for their new home. The winters of 1796-98 were very severe. The Maroons suffered discomfort and grew restive and angry at their situation. In the spring of 1799, Governor Wentworth felt obliged to dispatch Captain Solomon and 50 men of the Royal Nova Scotia Regiment to Preston where they withheld supplies from the most refractory so as to maintain order. Meanwhile, Wentworth became increasingly disillusioned with the Maroons as settlers, and the money from the Jamaican government for their support was wearing very thin. The Maroons were not in favour of the suggested ways of supporting themselves in Canada and seemed likely to become a charge on the public purse. Governor Wentworth, in accordance with the demands of the Maroons, concluded the best resolution would be to remove them from Nova Scotia to Sierra Leone in Africa. Although the majority of the Maroons left Nova Scotia, there were a few who remained: a census done in 1817 of the Black community of Tracadie in Guysborough revealed that several persons living there were descendants of the Maroons. The Maroons also left descendents in the Preston Area of Halifax County.